I like cats. In fact I even wrote a book about one (cheeky plug) but I can’t spend too much time with them because of allergies. But as I approached this ‘musical’ where the whole cast is playing cats, I anticipated no discomfort or adverse reactions. I’ve been wrong before. The set is rubbish. But this is entirely intentional. It’s a tip, a dumping ground – objects and litter (the rubbish kind not the kitten kind) have been scaled up, larger than life, so that the performers appear reduced to cat-size. The rubbish spills out across the apron and over the pit. It’s an impressive installation. The music strikes up with a discordant, fairground-like tune and a flying saucer lights up and takes off, leaving us in this post-apocalyptic landscape where human/cat mutants cavort and dance and sing. There’s a big opening number setting the scene. They are something called ‘jellicle cats’ apparently. The stage is full of performers, dressed in variations of the cat theme: plain, spotted, striped. Big hair and legwarmers ground the show in the decade of its making. They’re all bloody good, Let me make that clear: there is not one of them who is not top drawer. I will mention a few who stood out and whom I was able to identify beneath all their face paint. 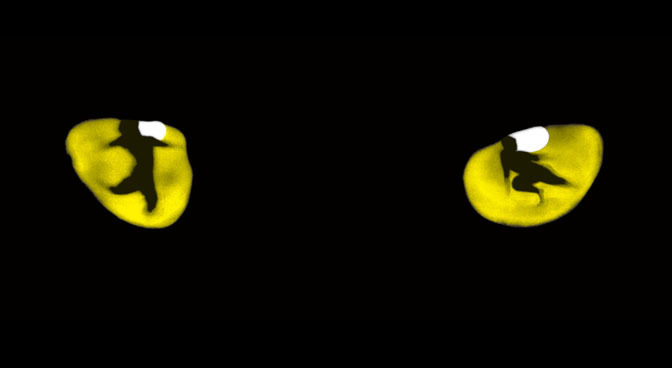 Ben Palmer impresses as Munkustrap right from the outset; Barnaby Thompson and Katie Warsop are a fun double act as Mungojerrie and Rumpleteazer; Oliver Savile’s Rumtumtugger and Joseph Poulton’s Mr Mistoffelees deserve special mention. In fact I could staple the cast list to this review and pat them all on the head. The performers aren’t the problem. The problem is the show. It’s like a jukebox musical except rather than shoehorning pop songs into a storyline, here the poems of T S Eliot are very loosely linked in a framework that doesn’t really go anywhere. What we get instead is a parade of characters who come on, sing about themselves or have themselves sung about, and then off they go so the next can come on. It’s all exposition and no development. It’s like announcing the arrivals at a function and making a song and dance about each new guest. It’s all gong and no dinner, and shallower than a litter tray. There is a moment where there is the potential for drama. An old bag-ladylike cat shambles on in a matted fur coat and looking the worse for wear. The bright young things shun her and scratch her until she shambles off again. This is Grizabella (the superb Joanna Ampil) and she gets the best music and gets to belt out the show’s only hit, Memory. So more fool them. After their rough treatment of Grizabella, I was less inclined to enjoy the prancing about of the rest of them. I was striving to engage emotionally with any of them and I sided with the underdog, so to speak. For the benefit of an old fat cat, they stage a re-enactment of a skirmish between some dogs. Later in the second act, an old theatre cat reminisces about his former life and we get an extended fantasy sequence in which they’re all pirates. This would be fine as an interlude, a play-within-a-play along the lines of Uncle Tom’s Cabin in The King & I – but there is no main plot to begin with. This is more of the same but in different costumes. Speaking of Uncle Tom, by the time we get to Skimbleshanks the “railway cat” I have had enough. This cat works for his human masters and is rather smug about it. I don’t give a toss. But on it goes. More new characters. More singing and dancing in that egocentric manner you get with rappers, singing about themselves in the third person. Shut up, I thought. Stop it. Do something else. Tell a joke. Pull a gun on someone – anything! Just please, do something different. Yes, you’ve got a great voice. Yes, you’re very nimble. But please, make something happen. I begin to panic. I wonder where the fire alarm button is. Or the number of a good vet. I just want it to end. No! Stay on the stage! Get back on the stage! Keep away from me! Let’s have just one more reprise of Memory and let that be an end to it. Please! I’ll be a good boy from now on. Just make it stop.